Sealing around cables having pre-made connectors can be a problem. 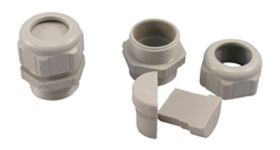 You don't want to cut off a molded connector, but you need a tight seal. This cord grip's unique split insert is the solution. Drill one or more holes along the split for routing your cables. If you drill a hole exactly the size of your cable's diameter, the resulting seal will be IP67, NEMA 4X water-tight. Drill the hole not more than ten percent larger than your cable's diameter, and the seal will be IP65, NEMA 3. This model is made from polyamide. Contact us for similar designs made from stainless steel and NPB, as well as additional sizes. Inserts are available pre-drilled for your cable's diameter at additional cost.